I’m not sure how you pronounce the name exactly — “pete’s-ay-ee-oh-lee,” perhaps — but I sometimes think of adding an “ee-oh-ee-oh,” as if we were yodeling. Anyhow, I met up there for lunch last weekend with readers Doug Evans, Hugh McBride and Elizabeth Casian, allowing for a four-way review. 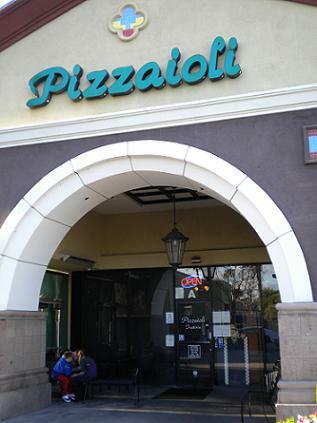 Pizzaioli, in the Chino Spectrum center, has been in business since 1995. Despite the shopping center setting, the interior greets you with a well-stocked bar and an elegant feel. The dining room is adjacent and there’s also patio seating. The ambience is upscale-casual, reminiscent of Macaroni Grill. 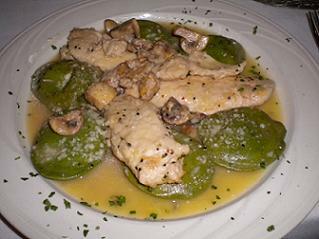 The menu boasts fancy pizzas, paninis, salads, pastas, seafood, steaks and chops, with entrees ranging from $10 to $30. Our table had eggplant parmesan ($15), described as “fantastic”; chicken al vino ($15), “very good”; manicotti ($13), called “okay” (blah cheese, decent sauce, but a large enough portion to take home half); and chicken with spinach ravioli ($15, pictured), mine, which I’d say was “not bad,” although the presentation looks more slipshod than it seemed at the time. Some of these items were daily specials not on the regular menu. We also had dinner salads ($7 each). Service was attentive but they knew to leave us alone to enjoy a long, chatty lunch. Overall, good, although perhaps a few bucks pricier than strictly necessary. You could do a lot worse. Apparently it’s especially popular for weekend dinners. Pizzaioli-oh-lee-ay! This entry was posted in Restaurants: Chino and tagged Chino, pizza, restaurants by David Allen. Bookmark the permalink. Our family has regular debates about the location of (Peezeeoli). They always say Chino Hills but I believe it’s on the border of southwest Chino. Yet again, the sweet, fickle taste of fame… a couple more blog mentions like this, and I’m headed off to the bright lights of the big city! A great time was had by us as well… I noticed how an “hour or so” lunch became almost three and a half hours. Truly good times! So is that how the dish looked when it came out? I’m almost expecting to hear bud…wei…serrrrrrrrr.